When: Thursday, April 6 at 1:30 p.m. The UBC Okanagan women’s volleyball team competed in the Final Four of the Canada West championships earlier this month, closing out a season during which they were consistently among the top 10 best teams in the country. 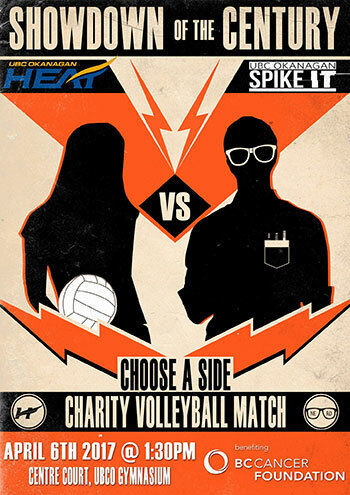 On the afternoon April 6, they’ll face a challenge playing against “Spike IT”—a team formed by the UBC Okanagan IT, Media and Classroom Services department—in a fun charity match to raise funds for the BC Cancer Foundation. The match is at 1:30 p.m. on Thursday, April 6, in the UBC Okanagan gymnasium. Admission is free but donations are encouraged. If you’d like to speak with the organizer, Rob Hartmier can be reached at 250-807-8844 or by email at rob.hartmier@ubc.ca.